Location: Located near Osman Sagar Lake and surrounded by lush greenery, Golkonda Resorts and Spa has a classic portico-based architecture. About 27 km from Secunderabad Junction, the resort is accessible in less than 45 minutes from Rajiv Gandhi International Airport (35 km). Popular attractions like Golconda Fort and Qutb Shahi Tombs are about 12 km away. Further, the famous Charminar and Nehru Zoological Park Hyderabad are within 20 km. Room Amenities: Guests can stay in spacious and well-furnished rooms, or even better, choose a villa with private pool for complete relaxation. Further, each air-conditioned room includes modern facilities like cable/satellite TV, DVD player, refrigerator and Wi-Fi access. Well-kept bathrooms come with hot/cold showers and exclusive toiletries. Hotel Facilities: At leisure, relax in the outdoor pool, or enjoy leisurely walks in the landscaped garden. Fitness-conscious guests can enjoy healing massages and work out at the modern gym. The hotel also has a professionally managed convention centre for hosting private and corporate functions. Besides, facilities of indoor games, steam room, babysitting, sauna and parking are available for added comfort. Dining: Jewel of Nizam The Minar is the fine dining lake-view restaurant with eye-catching interiors that capture Nizami mood and grand lifestyle. 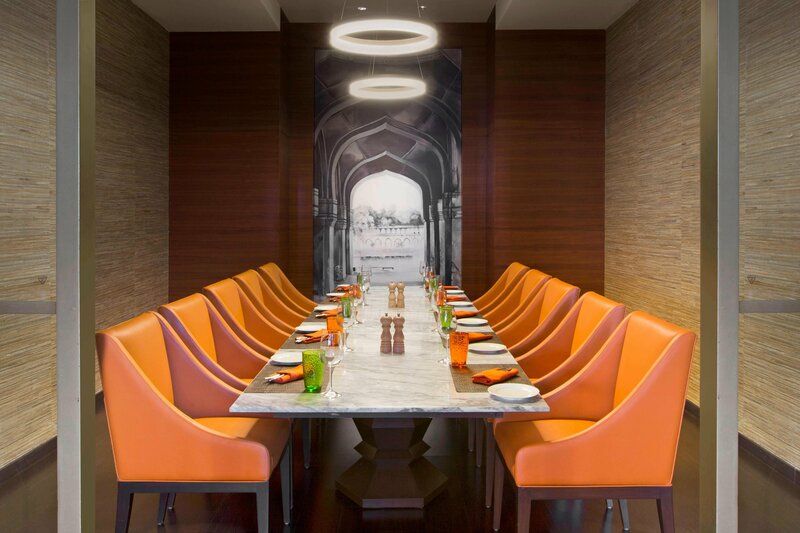 Here, guests can relish signature dishes like Murgh Ka Tikka, Boti Kebab, Kaju Malai Ki Seekh and Jheenga Nizami. Additionally, Kacchi Dum Biryani and Mutton Rogan Josh are a must try! Overall good resort, but had a problem with GST invoice while booking from make my trip. Nice place. Good property. 5 star rating. Very good resort to stay with family. Except the cost of food all was good. They can at least give some option of a cheaper restaurant at the venue or include food with packages. Hot water shower did not have adequate force. Very good hotel. A pleasant nature and good hospitality. Rooms are good, ambience is excellent. However food and other facilities are very costly. Not worth the amount they charge. Very less options for room guest's for recreation. Swimming pool is open for day guests also, those attending conference or company outings. So privacy for room guests is compromised. No proper games room and park as well. It's the place couple to be in privacy. It has beautiful gardens and lawns, the dining by the pool side and in the vintage looking minor restaurant are a memorable experience. Would love to visit again. Had a very good time, the staff were very pleasant. Charges are too high so better to concentrate. Except the food prices, all is fine. Too costly. Nothing everything is fine and thanks for the service which you provided to us. Messy in terms of guest services. The mini bar charges are exorbitant. Even more than the MRP. The greenery and swimming pool maintenance is excellent. Food is excellent but little costly. Overall very good for one day stay. Charges for chips and cashew nuts was too high. Charged 4 times more than MRP. Staff was polite and very nice. Swimming pool was dirty with frogs swimming and water opaque. Cycle was old. Great gym and indoor games bathroom had large glass windows which was weird. A friend came, so we asked for a coke which is not provided by the staff. Irresponsible staff. Great location with good food and nice amenities with lot of greenery around and close to the city. It was a short stay. I wanted to spend a weekend alone out of the city. Since it's a summer I did not want go for a drive or ride in the heat. So I booked a villa in Golkonda resorts for a night. This resort is located near Gandipet Osman Sagar lake. There many activities to do in the resort which is for group travelers or couple. Peaceful place to read, as I enjoy Reading I went for a stroll in the resort found a peaceful place and spent my time Reading there. Staff is so friendly and helpful. Rooms are well maintained, and service is okay. In a nutshell, though the price is expensive this resort is worth a visit, not suitable for solo travelers I guess. It is truly a Golkonda Resorts and Spa which still knows the real meaning of hospitality. The entire staff was very caring and whenever we looked for them, they simply went all the way out to make our stay memorable. Right from the reception the moment we checked in we were handed over a personel greetings letter from the GM of the Golkonda Resorts and Spa in which not only he thanked us for choosing Hotel GOLKONDA but also assured his personel asistance to look after us round the clock and he even left his contact nos, this really touched my heart as it reflects a true sincere and commited approach towards their guests. I went with my family to stay in Golkonda Resort. This is not the first time that I went to this resort. The reason I choose this resort is because I really like the ambiance and the room, as well as the service. I am very happy but there is one thing that really disappoints me and that is most of their activities like indoor outdoor games are not at par and also they charge money for small things like cycling, snacks, etc. Their new restaurant is darn awesome though it's bit expensive but it's really worth it. Overall it's a good place else to hang out and if you have a big family, friends you will really enjoy. Cheers. The room turned out to be better than I expected. The bathroom was as big as a small room. The room itself had a separate sofa section giving it an extended room look. The greenery outside the rooms was just amazing. They had all the indoor and outdoor games facilities. I stayed at their lowest greewood villa. Curious to see what their higher level rooms looks like. One thing that I wished would have been better is their swimming pool. Though quite sufficient, lack of slides like in leonia, made it a bit less appealing specially for kids. Otherwise overall would recommend. I have been coming to this place from past 4 years. Every time I come I always experience a beautiful feeling. The greenery and view is awesome. But my recent visit observation is they have rippled the food cost. Even the room rates they have increased a lot. Previously it used to be 4500 per day now its min 7800 per day. Can you imagine a small bear costs 250+taxes. It's definitely a beautiful resort to stay. But now a days they have tremendously increased the prices for both food and room. Pros: 1. No doubt it's one of the best resort, equipped with all amenities. 2. Pool is main attraction, tennis court, volleyball court is there. 3. Fun activities of kids are there, they'll have a great time here. 4. This resort is really big, nicely decorated, evening walk is a must to do thing. Cons: 1. No MRP regulations are there. 10/- lays comes with a cost of 40/- + extra service tax. No complimentary snacks is present, only two bottles of water - that too normal. Everything was going fine. In fact awesome. Until one guy at the end came up with a false statement saying I ruined the bed sheet with lip stick or blood stains. First of all that wasn't blood stains... He is such a dumb. Then I really got mad and told to check my bag to see if he could that color lipstick. Then I told him that I am gonna pay for it. I have been travelling the whole world and been to the best of the places but never experienced such a situation. Location was not very far from the city and it was well maintained. Food was good but overcharged. Room was good I enjoyed my stay there. But one think I felt wrong was charging for each and every thing we consumed there, even for water bottle. It would be better if they include these charges in the room charges itself. It felt very cheap for a Golkonda Resorts and Spa of such a big status to charge and put money tag on every thing in the room. The room was spacious but it had a bad smell and both the phones were dead due to which we couldn't even order tea in the morning. The spa therapist was great but again the robe, towels and sheets were smelling of oil and needed a lot of cleaning. Jewel of Nizam was the best part of our experience. Food was amazing, ambience and view was out of the world. Do recommend the restaurant but don't think I will stay in the resort again! Property is good & properly maintained however their commercial practices can be questioned. They still charge 5% service tax in spite of Central Govt prohibiting it, in spite of supreme court order, they charge 5 x price for a MRP printed water bottle & last their breakfast is not worth what they charge I. E. Close to Rs. 800. So barring these commercial aspect, rest OK for a one night weekend stay... Not more than that. Entrance is excellent, reception people were quite nice, process was simple and easy. Room was very neat and staff was cooperative. Location is at outskirts of Hyderabad and need advance booking to enter tower and Golkonda Resorts and Spa which we didn't know. Had lunch next day. It was nice showing Nizami styles. Must be better in night for dinner. Get advance booking along with Golkonda Resorts and Spa booking. Tasty food, great environment, clean and spacious washrooms, perfect location, decent service, clean property. Clean, great environment, spacious room, awesome washroom, tasty food, good service, but checkout time is little early when compared to other resorts or star Golkonda Resorts and Spas. Check in at sharp 11 am is not that easy so management people should think about it. Nice place to be on a holiday. It's a typical resort. Rooms are clean and tidy. Not much to explore but it's good and has everything that a typical resort should have. Pool dip is a highlight of all besides the environment. Food is good but a bit over pricy. Went here for a special occasion with my wife for 2 days. It was a pleasant experience away from the city atmosphere. It is a great place with high maintenance and good staff. Have good options regarding food but overall activities are a lot less which makes it difficult to enjoy for more than a day. Jewels of Nizam is the highlight of the resort. Amazing rooms, amazing food and ambience... The only thing I was not satisfied with is the pricing of food and beverages and the taxes... Cost is high... At least you can cut the taxes to some extent. Resort facilities are also amazing. Hotel ambience was good. Room was little smaller when compared other star resorts. Informed reception to keep things up ready in advance during check-out, things got delayed. Ordered for noodles and got fried rice which was something I didn't except. Need to keep your service standards. Otherwise, resort is good for family day out. Everything was just perfect !!! They should just improve their Breakfast menu and look after the items being served. I was disappointed with the breakfast. I would definitely go back for the ambience and Location. The staff of the Resort were very helpful and the service was brilliant overall. Nice stay, great environment, great time pass, beautiful location, tasty food, 5 stars. Facilities (wi-fi; power backup) has a scope for improvement. Wi-fi had connectivity issue and there was power outage once in night. Food was great and location is awesome however did find much recreation for kids especially. There is no children indoor play area or activities for kids. We had a One Night Stay in Green Wood Villa. Room is good, but we had few issues like some continues noice whole night which was said to be AC outdoor and AC not cooling the room accordingly. I liked my stay although. Enjoyed the lunch in Jewel of Nijam. Pool was good, spa was good. Food supposed to be better to what they charge. Location is a must visit for it's greenery. Good place for a day out with family. Not very far location-wise from city, quiet and relaxing place. Checked in with kids, good service. Cost wise the prices are premium for F&B - but it's quite ok for such properties. Room that we opted was quite clean and neat. Outside pool options were good for both adults and kids - kept neat. Good place for a short break and quite affordable. We had checked into this resort, found the place very good and even the architecture is appreciable. Everything is perfect at its place. We enjoyed the stay and found better that other Golkonda Resorts and Spas in the city. The only disappointment was the food which was not only expensive but also worst. It's clean, neat and the service was on time and cool location. Had good time. Most of time spent roaming around the place, took lot of pics and jewel of kitchen was good (place). Food was decent, pretty costly to eat but overall, experience was nice. Well located and good service... Had gone for a family. Outing totally worth it. Can add few more activities in the resort which can be more fun... Keep up the good work.. And good lunch at the jewel of Nizam. It was a perfect stay for us. We had spent two nights at the resort. The rooms are really neat and clean. The staff was friendly and punctual with their services. During our stay we had a good food at Jewel of Nizam and vetro. If you are young couple and looking for a quite and nice place to spend a day with your partner, please visit. Please do visit Jewel of Nizam, tower based restaurant for dinner which we missed. Also pool side dinner is just awesome. Little expensive but worth for money. Good place to relax and good getaway. No everything was good. Power plugs were not working.